A female California Democratic lawmaker who played a prominent role in launching the #MeToo movement is currently under a #MeToo investigation herself for allegedly sexually harassing and groping two men, a former staffer and a prominent lobbyist. In its bombshell report on the investigation, Politico notes that the high-profile lawmaker's alleged hypocrisy "threatens to seriously damage the nationwide movement that has been credited with bringing the issue of sexual harassment into the open." 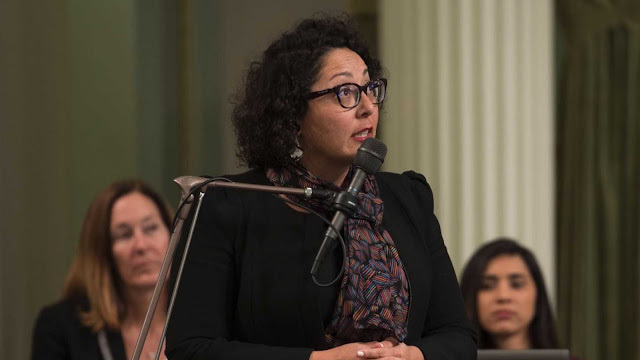 California Assemblywoman Cristina Garcia, who was featured on the cover of Time magazine's "Silence Breakers" to honor her role as one of the first lawmakers to speak out against sexual harassment, is, as Politico describes her, "a powerful Democratic lawmaker" who serves as chair of the Legislative Women’s Caucus, and "one of Sacramento’s leading voices on the #MeToo issue." She was one of hundreds of women from her area who signed a letter declaring "#WeSaidEnough" in protestation of sexual harassment and has claimed to have personally been a victim of harassment. Garcia issued a statement Thursday in response to the reports of the investigation into her alleged sexual misconduct. "Every complaint about sexual harassment should be taken seriously and I will participate fully in any investigation that takes place," she said in the statement. "The details of these claims have never been brought to my attention until today. I can confirm that I did attend the 2014 legislative softball game with a number of members and my staff. I can also say I have zero recollection of engaging in inappropriate behavior and such behavior is inconsistent with my values." One of Garcia's spokeswomen clarified afterward that the assemblywoman had in fact been aware of the report to the Assembly Rules committee, but wasn't aware of the "details" of the complaints against her.